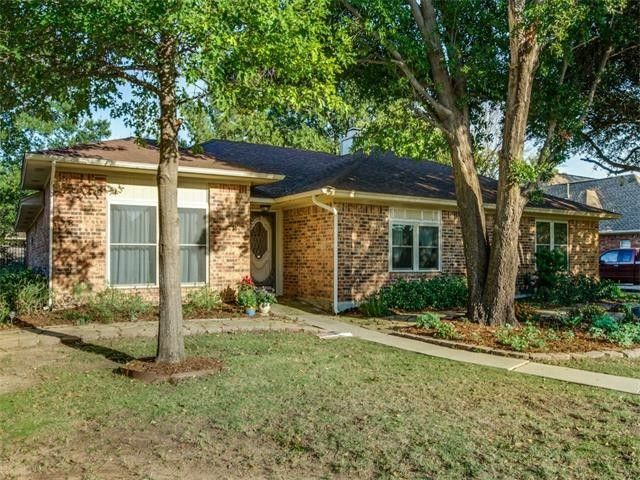 Updated with Wood Floors throughout & New 42 inch Kitchen Cabinets with Granite Countertops! 2 of the 4 bedrooms are extra large. The master suite includes 3 walk-in closets, 2 dressing areas & glass doors to the patio. The large 4th bedroom offers 2 closets & builtins. The big living room with a stone fireplace & wetbar has big windows out to the patio & deck. Formal dining off the entryway could be an ideal study! One-half bathroom off kitchen & garage area. Enjoy the private backyard from the 24x18 covered patio & the 12x8 wood deck overlooking the koi pond. The over-sized garage includes builtin cabinets, workbench & storage plus outside entry. A 17x11 storage bldg also! Directions: MULTIPLE OFFERS-- PLEASE SEND COMPLETE BEST & FINAL OFFERS BEFORE 7:00PM, WED., MARCH 29TH. &#xD;&#xA;Take Teasley Lane exit south off of I-35 E. Turn left onto Longridge & immediate left onto Fairfax. The home is on the right! Mortgage Company: Loan Simple, INC.